Jasmine Rogers performs a number as the Witch from Into the Woods. Young performers came to New York recently for a Broadway boot camp. They were honored at the Jimmy Awards, a national celebration of students who excel in acting, singing and dance. Felix Torrez performs a number from Beauty and the Beast. Torrez takes a selfie in front of a caricature of the Beast at Sardi's, a restaurant in the theater district. Actor and singer Adam Kantor coaches Rogers during a Jimmy Awards rehearsal. Seventy-four high school singers and dancers, selected from a pool of 50,000 kids across America, recently came to New York City to strut their stuff. They were participants in the Jimmy Awards, which honor the best high school musical theater performers from around the country. On their very first evening, they met each other over pizza in an overheated rehearsal room. After some brief greetings, they jumped right into the thick of it, learning the opening medley for a show which would be presented on Broadway in just a week. Felix Torrez, 17, came from Green Bay, Wis., after winning his regional award playing the Beast in Beauty and the Beast at his high school. "Being here already is an award itself," Torrez says. "Being able to perform on Broadway as a high schooler — I just want to soak it all in." 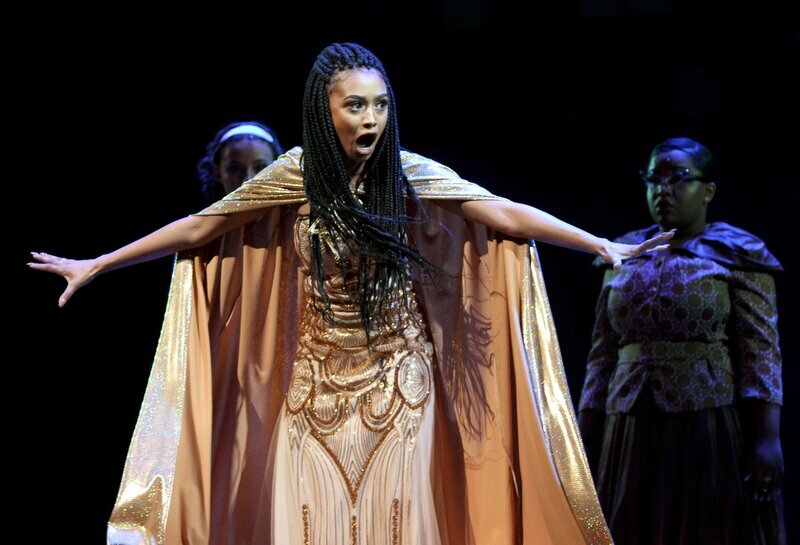 Jasmine Rogers, 18, from Houston, Texas, earned her spot at the Jimmy&apos;s playing the Witch in Into the Woods. Unlike Felix, she&apos;s seen many Broadway shows. "I didn&apos;t get into musical theater until I was seven," she says. "I used to play the violin and I was bad at it. One day a flier came home to do a production of Peter Pan. And so I auditioned and that was the first time I ever really got to do anything. I fell in love with it from there on and I&apos;ve been doing it since." For eight days, these teenagers were pushed hard. Only a few days after that first rehearsal, they had staged the opening number. Kiesha Lalama, the show&apos;s choreographer, says she expects a lot from these teenagers. "You know, if you treat them like professionals and really just challenge them to rise up, they do," she says. "And that&apos;s what I think is so amazing about it, is that these kids are willing and able. If you provide them with the opportunity they can thrive." One of those opportunities is that each participant is coached by a Broadway actor. Felix sang for Howard McGillin, who&apos;s done more performances of The Phantom of the Opera than anyone in history. Mind you, it wasn&apos;t all work. One night, the nominees had dinner at Sardi&apos;s, the famous restaurant in the theater district, before seeing Come from Away. Torrez was taken by the caricatures of Broadway stars that cover every inch of the walls. "After dinner I&apos;m going to go around and just take pictures with maybe every single one of these portraits," he says. "It&apos;s crazy being in here." The idea for the National High School Musical Theater Awards came to program director Van Kaplan about nine years ago. He approached the late James Nederlander, a Broadway theater owner and producer with a proposal. "I said: look, we&apos;d like to do this," Kaplan recalls. "We want [the kids to perform at] the Palace Theatre on Broadway and we&apos;d like to name it for you. And he said yes." But, instead of the Palace Theatre, Nederlander suggested the Minskoff Theatre, where The Lion King plays. The Jimmys — which are named for Nederlander — have been there ever since. The show is produced by the Broadway League, which represents producers on Broadway and across the country. On Monday morning, the kids had their dress rehearsal at the Minskoff. Torrez had never even seen a Broadway show until a few evenings before, and there he was on Broadway. "It&apos;s not until you&apos;re on that stage that you really feel that you&apos;re looking out into the audience and that you&apos;re seeing the lights," he says. "It&apos;s an amazing feeling and the whole day has just been exhilarating." Just a few hours later, he and his fellow nominees were performing the opening number in front of a sold-out house. "I&apos;m just supposed to go on to the next one, but I just have to dwell," he said. "These kids are insane! Oh my gosh." Felix donned his Beast costume and sang his solo in one medley. Jasmine did her number, too. In the second act, Platt announced the Jimmy Awards finalists — including Jasmine Rogers. And so, in front of friends, family and a lot of important Broadway producers and casting directors, Rogers performed a song from Aida — all alone, in a spotlight, center stage. Awards for best actress and actor ultimately went to Sofia Deler and Tony Moreno, both from Orlando, Fla. At the after-party, Rogers said she was just fine with the outcome. "All the people here, all the nominees are absolutely amazing in their own special way," she says. "It could have been any of us." Both Rogers and Torrez said they made new friends over the week, polished their already impressive performing skills, and came away with a renewed sense of confidence that they would definitely be back on Broadway.